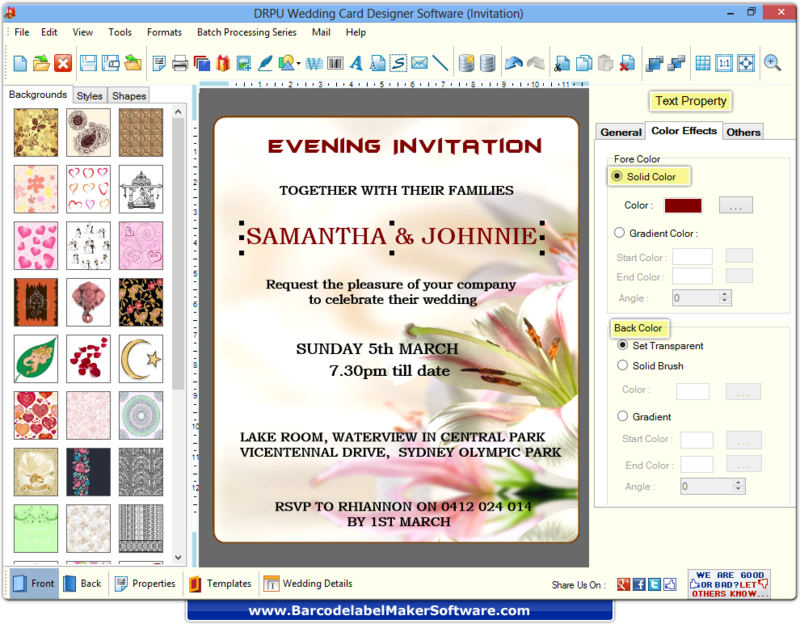 Wedding Card Maker Software is useful to design printable invitation cards. We provide advance featured Wedding card maker software to fulfill all your card designing needs. Invitation card designing software offers different designing tools including line, text, signature, shape type and other designing objects to design wedding card of your own color and style. Our DRPU Wedding card maker software is easy to operate and no need of any special skill to use it. Software provides option to add background, styles, shapes and verity of wedding templates on your wedding card. Batch Processing Series feature allows you to generate the multiple copies of Wedding Cards with different barcode and text value. Software provides option to design and print wedding card in rounded rectangle, rectangle, eclipse and CD/DVD shapes. You can set card name, card size and fold type according to your need. Software has option to insert images by selecting images from library or from local drive while designing wedding card. Card maker software provides option to save created Wedding card in (.wdr) file format. Take print of designed wedding invitation card using advanced print settings.